It has been a slightly surreal week, partly because a fifth week of dry, sunny weather making Lancaster look more like a desert than the waterlogged swamp it normally resembles. Primarily though, it is surreal for the events surrounding the death of Margaret Thatcher. The praise and tributes that seem to be coming in from all sides have made me start to question my own sanity and memory. The deification of Mrs T is starting to resemble that of Lady Di. Thank goodness for George Galloway who against the general gushings maintained an outspoken surety that the fires of hell are well stoked and will be well fed this week. By a strange coincidence our local cinema was holding a rare morning film showing on the day following her death. 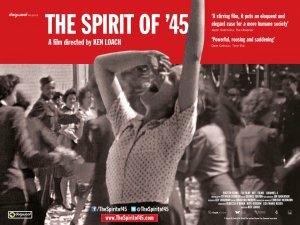 The film was Ken Loachs' Spirit of 45 , as perfect a piece of aversion therapy as one could imagine. It is lovely and poignant film, showing how the will of people and Parliament were able to completely redirect the devastated landscape and economy after the Second World War. Spirit of 45 showed starkly through the voices of working-class men and women of the time just how incredibly ambitious and visionary the nationalisation of the previously private health, energy, transport, housing and education systems was. That it was done in five years and transformed the lives of millions - and all at a time of the greatest national debt. It also showed in contrast how tepid in comparison our attempts at transformation seem today in response to the rampant neo-liberal agenda. 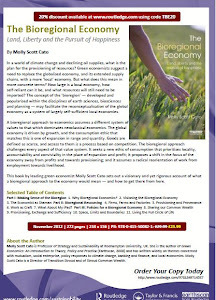 Spirit of 45 showed the need for a new 'post war economic revolution' to follow the end of credit wars, but this time that vision and passion is put into a demand for a more collective ownership of the creation of finance, the means and outcomes of production and the commons of the Earth. It needs to be one that transcends the state-led nationalisation ideal and the individual-led privatisation ideal. Margaret Thatcher probably died happy: she lived 7 days long enough to see the end of the NHS and the basic right of the welfare state to provide for those in need. Let's hope though that Thatcherism has died with her and new ecologically aware and socially convivial society rises where she saw there was none. Both my father and mysef lost our jobs (unconnected). I saw our fun loving and creative environment turn into oppression. I saw people change from happy to scared. We saw young homeless people for the first time on our streets. has been done to them and call for an undoing of thatcherism. whitewashing of the last day's festivities. There is the MSM media's version of history but in the undercurrent is a contrarian view bubbling, just like the cauldron of bubbling hell that hopefully awaited her. Mrs Thatcher did not put you or your father out of work. The market did. My dad and most of my family were put out of work at the same time. They were in the Print. It was what you are using right now that put them out of work - computer technology. I warned them all, I told them but they didn't listen. In fact Harold Wilson warned them in 1963, and they didn't listen. If you don't have the balls to reskill or upskill that's your problem, not someone else's.